The new #S now provides you with the most comprehensive range of facilities for the spectroscopy of polymers. The system has been specially developed to meet the increasing requirements from Polymer Researchers for more sophisticated techniques. AABSPEC has met these requirements with the fabulous #S which provides dual sample facilities for Comparative Spectroscopy, Transmission, Reflectance, UV Irradiation by Optic Fiber, Raman Spectroscopy, Raman Microscopy. From Vacuum to High Pressure, from Low Temperature to High Temperature, the versatility of the #S is unmatched. The #S has applications in polymers, paints, surface finishes, adhesives, resin curing, degradation and aging, pharmaceuticals, bio-polymers, etc. This new system can be tailored to meet your exact requirements and expanded as you wish. Just look at what the #S can do for you! The #S can handle two samples simultaneously, so allowing you to make continuous comparisons under the same conditions. The #S chamber mounts on a computer controlled drive mechanism which alternatively places each sample in the beam. Samples can be compared under the same conditions of temperature, pressure, etc., using transmission or reflectance modes. UV Irradiation To meet the need to study the precise effects of quantitative exposure to UV Irradiation, the sample can be irradiated through a UV Fiber Optic while under controlled temperature and pressure conditions. This #S option is ideal for studies of curing processes and for degradation and aging studies. RAMAN Spectroscopy The #S uses our unique Raman Window Technology to provide Raman Spectroscopy over a wide continuous temperature range (-150degC to 450degC) for solid or liquid samples. Our special Raman window design (patent pending) allows easy interfacing in all types of Raman spectrometer. The availability of a continuous low to high temperature range is vital in areas like Pharmaceutical research. 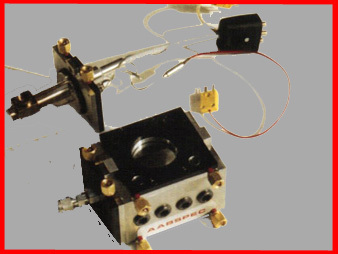 RAMAN Microscopy The #S chamber adapts to provide variable temperature/ variable pressure Raman Microscopy with a large working area for sample surface examination with high collection efficiencies using popular Raman Microscopes. This is yet another important experimental option provided by the powerful and versatile #S.
AABSPEC Quality and Back-Up For almost 25 years, AABSPEC has made significant advances in instrumentation for spectroscopic research. We lead through new technology developed to meet our customers changing needs. We deliver products designed and built to the highest standard and we back them with our 5 year parts and labor warranty. Our experience is available at any time to all spectroscopists. You can rely on AABSPEC. If we don't make it better, then we don't make it at all!